It is easy to set up personal and team fundraising pages on CauseVox. If you have not already done so, please check out our personal and team fundraising pages video guide article first to learn more about this feature. 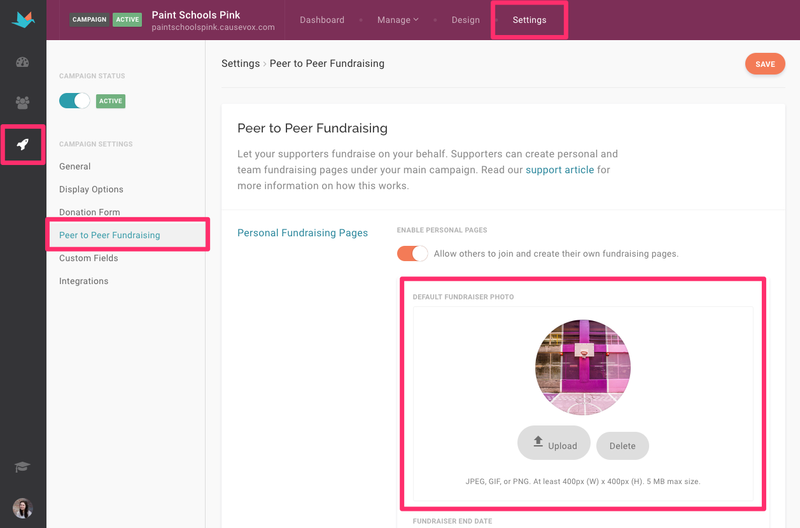 Step 1: In your Site Settings, along the left hand menu bar, click on the Personal and Team Fundraising section. Here, you'll be able to upload a default fundraiser photo. The Default Fundraiser Photo will automatically be set as the profile photo of the Personal Fundraising Pages. Usually administrators will upload the logo for their organization or the campaign. Step 2: Fundraiser End Date - Enable this to let your fundraiser set their own end date instead of following your campaign’s end date. Turn this on if you are running an ongoing campaign. Turn this off if you are running a campaign with a defined end date. Step 3: Enable Registrations: Turning off this will remove the "Join the Campaign" button from the campaign site. This is best if you want to stop new fundraisers from signing up at some point in your campaign. 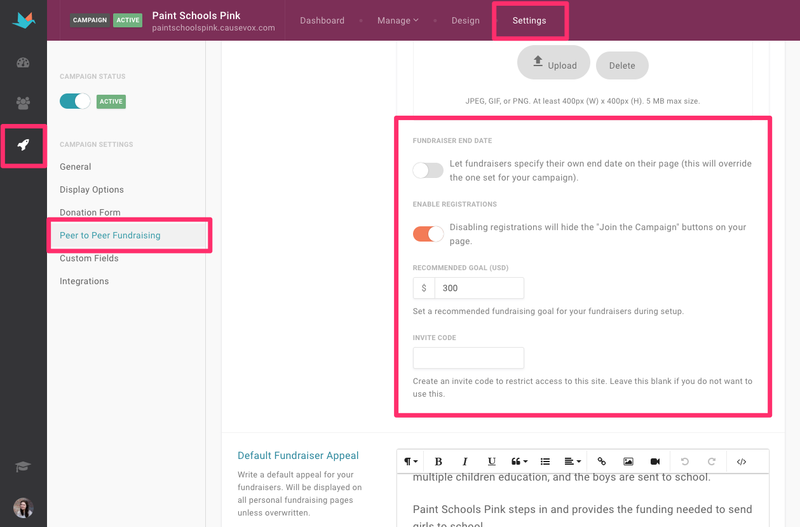 Step 4: Recommended Goal- Set a default goal that will auto-populate when a new fundraiser signs up. While they can still set their own goal, admins set use this feature to give the fundraiser an idea of how much the organization would like to see supporters raise. Step 5: Invite Code- Set up an invite code to restrict who is able to create a fundraising page. Organizations use this feature when they already have a specific group of people in mind they want to set up pages, and distribute the invite code to them prior to setting up their page. Step 6: Default Fundraiser Appeal- Write out the text that you want to automatically appear on personal fundraising pages. While they can edit this, you'll want to enter in text that can work on their page even if they don't edit it. This is helpful so they have something to work off of. Step 7: Teams - Enable this feature to let fundraisers join and create teams. This is best used where there are specific groups of people who would benefit from fundraising together. 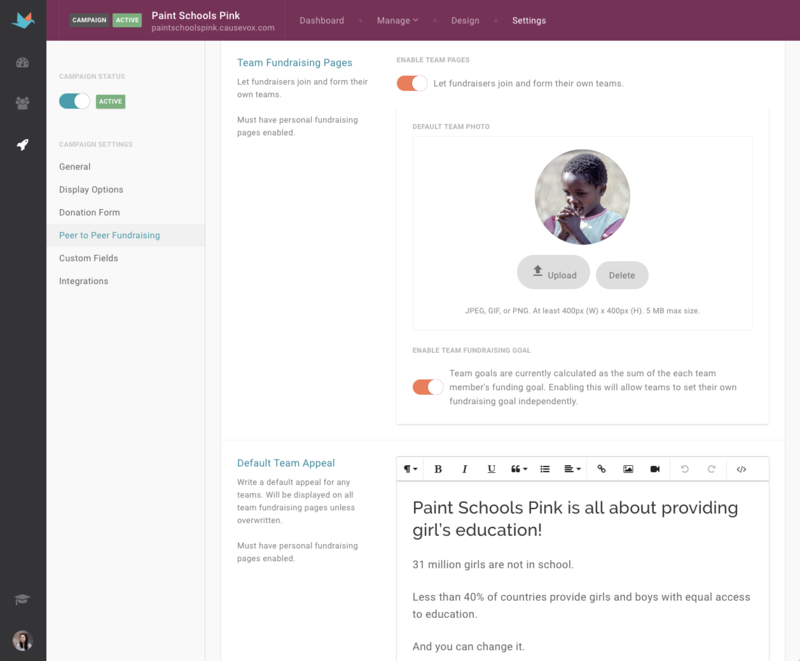 You can also enter in a default team photo, enable team fundraising goals, and create a default team appeal. Step 8: Scroll down to view the welcome email. 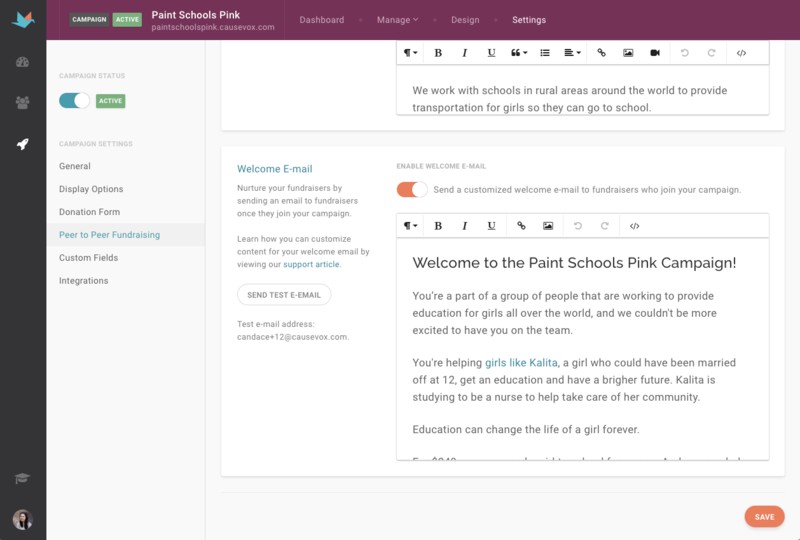 The Welcome Email is a feature that sends an automated email to the fundraiser when he/she registers for a personal fundraising page on your CauseVox campaign site. Next, just click Save and you're done! *Note: Be sure to update the design/appearance of the fundraising page template in your Design Site area.